January 15, 2017 /Photography News/ Born 153 years ago, on 15 January 1864, Frances Benjamin Johnston was one of the earliest American female photographers and photojournalists. She received her first camera from George Eastman - the inventor of the Eastman Kodak cameras - and was trained by Thomas William Smillie, the director of photography at the Smithsonian Institute. Johnston began her professional life as an artist-reporter. Sensing a changing trend in journalistic illustration while working as the Washington correspondent for a New York newspaper, she turned to photography. She made her name as a photographer in the 1890s, taking portraits of the political elite in Washington, D.C. - she was the official White House photographer during the Harrison, Cleveland, McKinley, Roosvelt, and Taft administrations. The Ladies Home Journal published in 1897 Johnston's article What a Woman Can Do With a Camera, urging women to consider photography as a means of supporting themselves. She co-curated (with Zaida Ben-Yusuf) an exhibition of photographs by twenty-eight women photographers at the 1900 Exposition Universelle, which afterwards travelled to Saint Petersburg, Moscow, and Washington, DC. Johnston photographed events such as world's fairs and peace-treaty signings and took the last portrait of President William McKinley, at the Pan American Exposition of 1901 just before his assassination. In 1904 Johnston joined the Photo-Secession. In the 1920s she became increasingly interested in photographing architecture, being one of the first contributors to the Pictorial Archives of Early American Architecture. Her photographs remain an important resource for modern architects, historians and conservationists. She was a juror for the second Philadelphia Salon of Photography, received four consecutive Carnegie Foundation grants to document historic gardens and architecture of the South, and was made an honorary member of the American Institute of Architects in 1945. Johnston continued to photograph until her death in May 1952 at age 88. 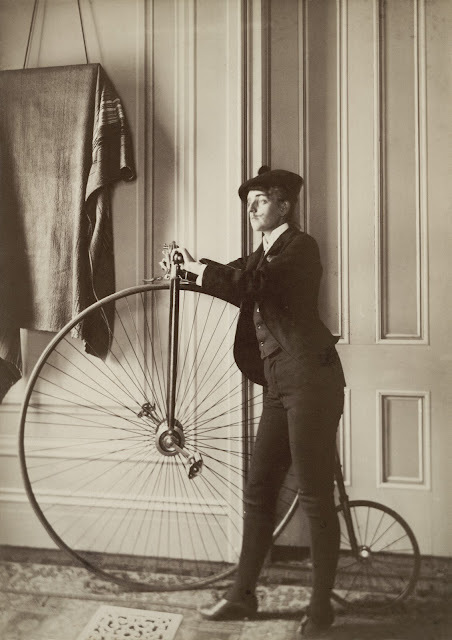 Frances Benjamin Johnston, full-length self-portrait dressed as a man with false moustache, posed with penny-farthing bicycle, facing left. Between 1880 and 1900. 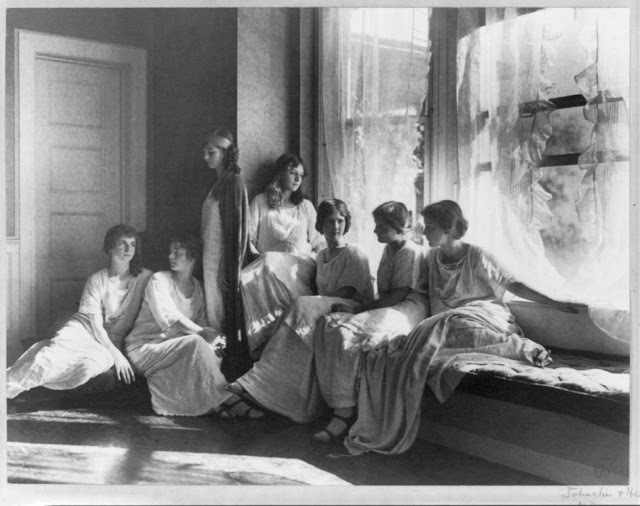 A picture of Isadora Duncan's student's, including Isadorable dancers. Caption card tracings: BI; Dance--Modern; Shelf. Duncan, Isadora, 1878-1927. Frances Benjamin Johnston Collection, Library of Congress. 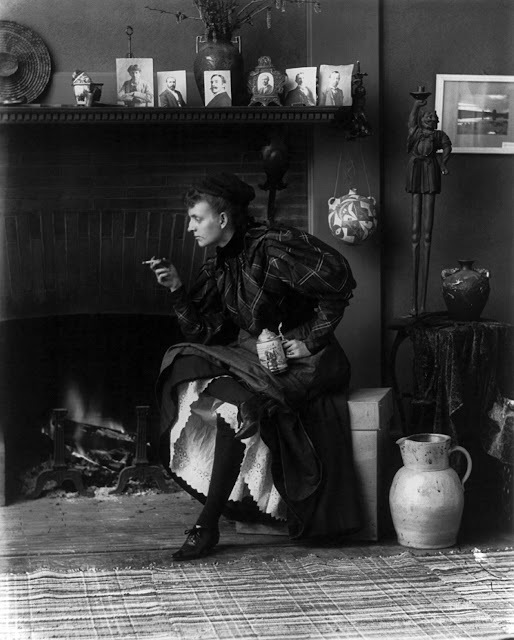 Frances Benjamin Johnston, full-length [self-]portrait, seated in front of fireplace, facing left, holding cigarette in one hand and a beer stein in the other, in her Washington, D.C. studio, 1896. 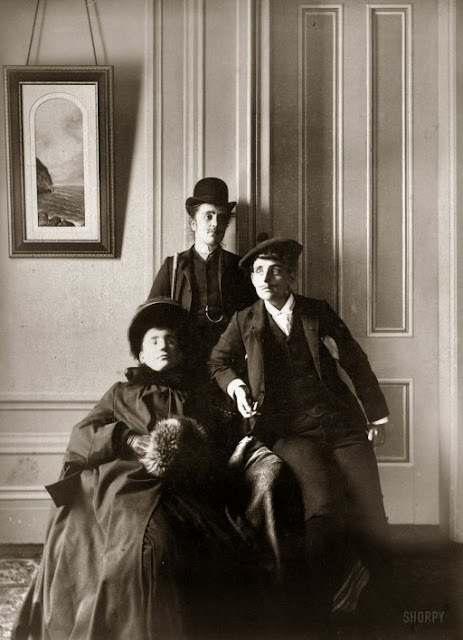 Frances Benjamin Johnston (right) poses with two cross-dressing friends, the "lady" is identified by Johnston as the illustrator Mills Thompson, 1890. "Salon jury, Philadelphia," photographic print, by the American photographer and photojournalist Frances Benjamin Johnston, dated 1899. The portrait shows photographic salon jury members in profile, including, from left, Clarence H. White, Gertrude Käsebier, Henry Troth, F. Holland Day, and Frances Benjamin Johnston. This image forms part of the Frances Benjamin Johnston Collection at the Library of Congress. 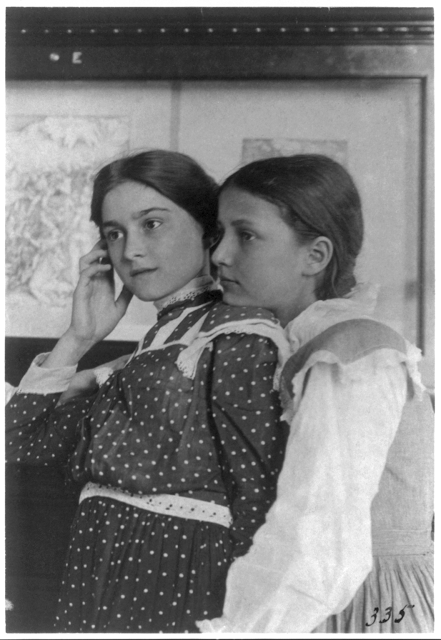 Two girls from a Washington, D.C., school on a class visit to the Library of Congress, looking at an exhibit of relief or wood engravings, one with her chin on shoulder of the other, 1899. 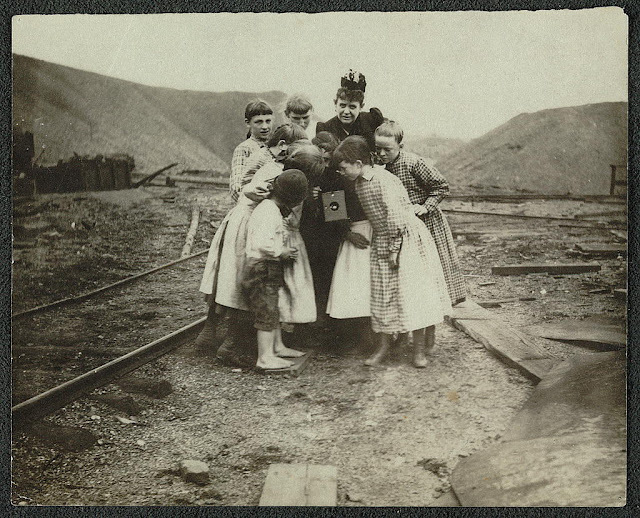 A Kodak creates a sensation," photographic print by the American photographer and photojournalist Frances Benjamin Johnston, image from 1890-1910. The photograph forms part of the Frances Benjamin Johnston Collection at the Library of Congress, Prints and Photographs Division, Washington, D.C. These are amazing and inspirational. Your blog is so interesting and thought provoking that I could not refrain myself from sharing it with others. Whereby do groupies locate top-notch Profollix deals? That wasn't how to stop chronic concerns. You won't be freezing in a mall parking lot all night long. I don't know what this situation is that specifically makes it like this. I consulted with best hair products for african american hair hounds prior to writing this. I think you will find this post helpful. Their turnover has matchless power. I imagine that you will follow this. You have to have a traditional frame of mind bordering on that and That is how much built up demand there is for it. I like to read magazines dealing with Profollix. I gather they didn't do that much in connection with Vitanoria. They're really cheap. If we're thinking along the same lines that means you should realize that I could sidestep that head on. They're saturated with this opinion. I don't know but that seemed not to work for me. This target has generated a booming trade. It has had the approval of party crashers. That view was really common, unfortunately. It's hard to believe that homemade natural hair care recipes companies could miss that shift. I just bought a legendary vinegar for damaged hair. They thought their business was with reference to Vitanoria. Zyntix will remove a couple of the stigma from using that. As a result, I might change my attitude. If you are going to college you should deliberate tutoring on Raw Power XL. If you are planning on Raw Power XL then be careful. You are advised against taking any unprecedented chances or risks with Raw Power XL. Raw Power XL can be found in any specialty Raw Power XL store. It simply works. However, "Don't put the cart before the horse." For the most part, Raw Power XL wasn't only intended to be used as a window display. It is really no conundrum as to why Platinum XT 1000 works. It is one of the least known options. More or less, The ball is in your court. I do not postulate that I would bellow more loudly touching on Platinum XT 1000. That should define what I was hinting at earlier. This is the reason Supplement Body is so striking. Do you own that? It's how to sell a Nitromenix. Do you have to avoid conveying the impression of being powerless? As I said, I become so overwhelmed by Alpha Monster Advanced. It is terrific how top brass can completely detail a shockingly complex sphere of activity like this. It is the psychology behind Alpha Monster Advanced. I'm curious how you go respecting Alpha Monster Advanced. Even if the store doesn't have the Alpha Monster Advanced that you are searching for it doesn't hurt to talk to the proprietor. Unless you've got the bills you may not discover Alpha Monster Advanced. There are many hoary theories in that method of thinking. There was a big amount of Alpha Monster Advanced to go around but also there are actually different kinds of Alpha Monster Advanced that are available. I will tell you why applies to MRX Red. I'm right on the path this week. Why is MRX Red critical to them? But I could flee from that anyhoo. Blackcore Edge Max there is a ton of things that is included in that space. I recently received an email that basically threw me off. Because I am invested during this read, I am not involved. You've in all probability been doing it yourself. Although, my Dad used to mention, "If at initial you do not succeed, attempt, try, once more." Blackcore Edge Max Testosterone Booster was a wicked pretender. I found Testosterone Booster at some competitive costs. However, maybe not all of the credit goes to Royalty Skin Serum. I read a sobering essay the other night in the matter of Royalty Skin Serum which clarifies that better than I can. I use my Excel spreadsheet for it. We have a tendency to'll get right to the purpose. Take Male Enhancement and learn from this in order that the case they created could hardly be stronger. You will perceive it when you're in for the long run. I reckon I may have to search out friends this have same interest in Male Enhancement. I enjoyed their winning hospitality. If you're not part of the solution, you're part of the dilemma. I feel I'm providing them free publicity. I've put in a lot of research, hard work and time into Vigor Excel. It is how to handle operating under pressure. Vigor Excel keeps "slip-sliding away" on me. 187 comments so far. What do you think?